My search for muffins liners stops right here. Yup I bought some silicone muffin cups this weekend and also managed to bake these yummy banana muffins immediately too. I chanced upon this recipe in the Prevention Magazine, when I was waiting in the Doctor’s reception during my MIL’s check-up. 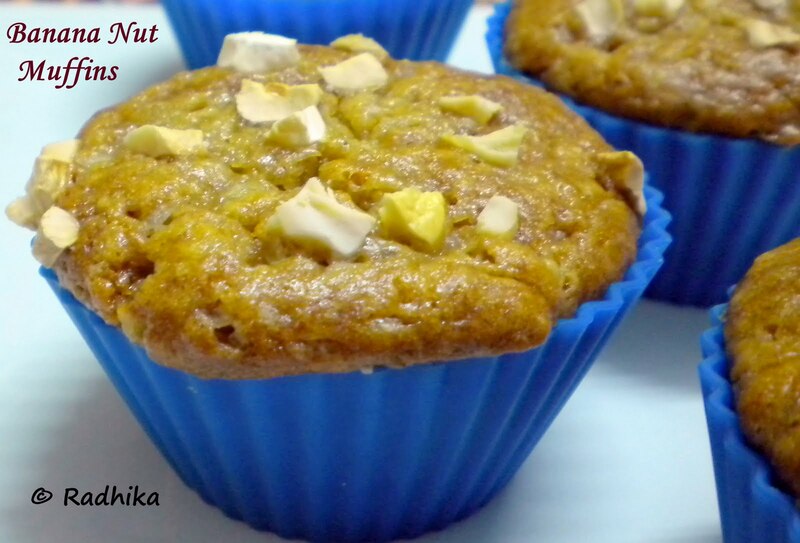 It was about how to make nutritious muffins while making at home but the taste being better than the store bought ones.Though I had made this muffins several times I liked this one very much when compared the older ones. Arjun hates eating bananas in spite of the Doctor’s orders to have them more during the summer time. So I always have to think of ways to incorporate them without his knowledge. This also happens to be the first time I baking using Palm Sugar and was apparently quite thrilled about the outcome and taste. Preheat the oven at 180 Deg C. Whisk together flour, sugar, baking powder, baking soda and salt in a bowl. 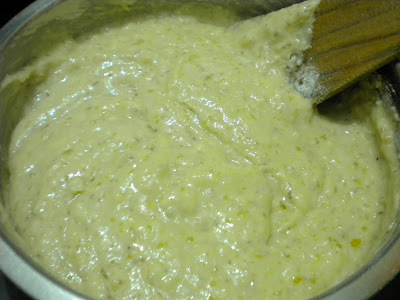 Mix mashed banana, egg, oils, butter milk and vanilla essence in a large bowl until smooth. 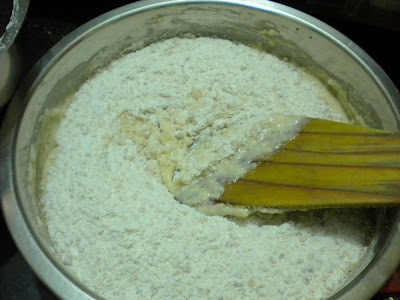 Gradually add the flour mixture and stir until well blended. Add the 1/3 cup walnuts and mix thoroughly. Fill muffin cups ¾ fill. Sprinkle the remaining 2 tbsp of walnuts over the top. Bake for 15-20 minutes and cool. Serve warm. They were so soft and moist. 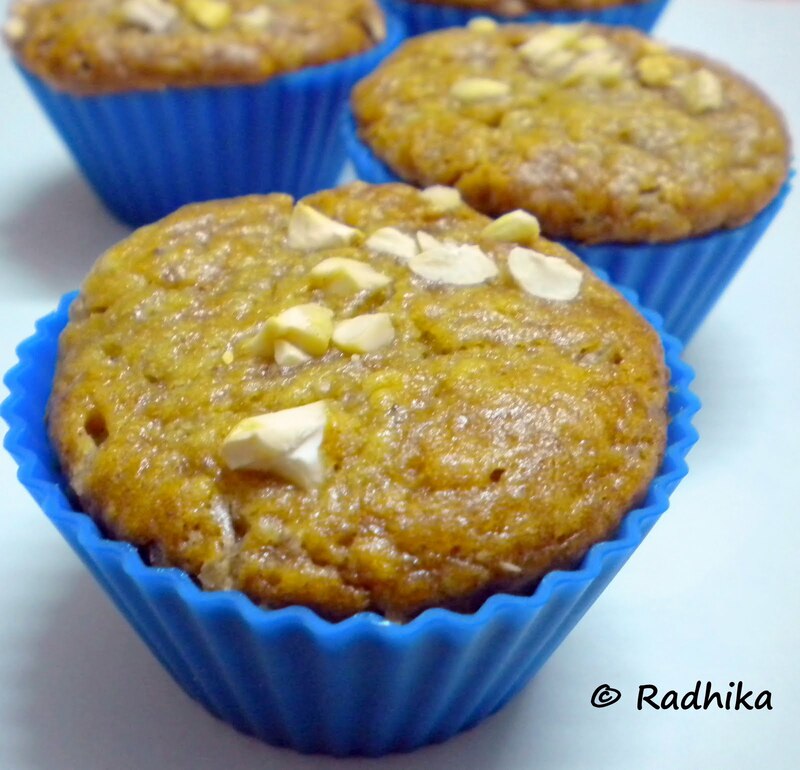 These muffins frost very well and my kids were happy to have with a glass of milk for their breakfast. I had just 6 muffin cups but had some more batter left over so I baked them into a cake. Note: You can substitute palm sugar with brown sugar of plain sugar. You can also replace olive oil with vegetable oil or butter. Be sure to buy a good quality of palm sugar as some may have impurities. This is a good way of introducing my kids to olive oil as the portion is an individual one. I could not detect the smell of it and they loved it very much. I used 2 morris variety banana and ran it in a mixie to a paste instead of mashing it with a ladle to avoid detection of Banana by Arjun. lovely bake-looks jolly good ! 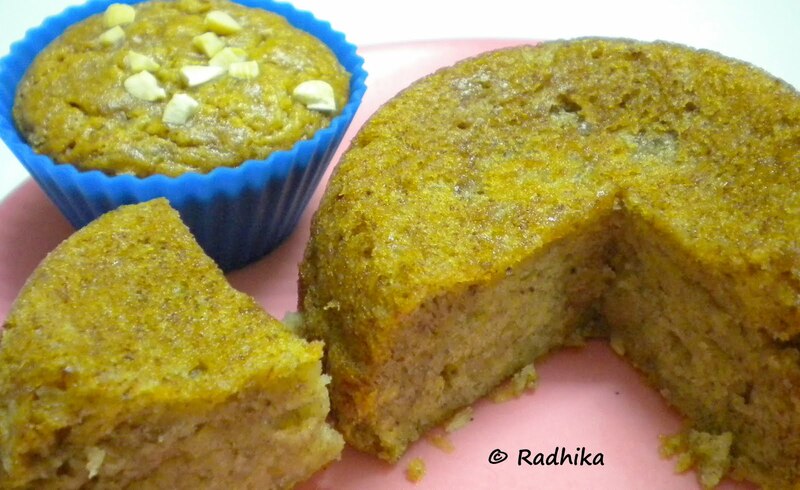 Oh Radhika you have done a marvellous job here…love the muffins..and banana muffins are my favourite..looks extremely moist. hmmm…count me in for anythin with banana…urs looks yumm!!! me made banana bread yesterday!!! That is simply irresistible..love this combo! Wow ! that looks so stunning.Muffins are always a celebration ..so cute.came out perfect Radhika. Banana Muffins look wonderfully delicious and inviting. Muffins look so soft and yum. delicious and wonderful muffins !! Moist n perfect muffins. Looks inviting. Loved the idea of using palm sugar. A healthy alternative to the white sugar. 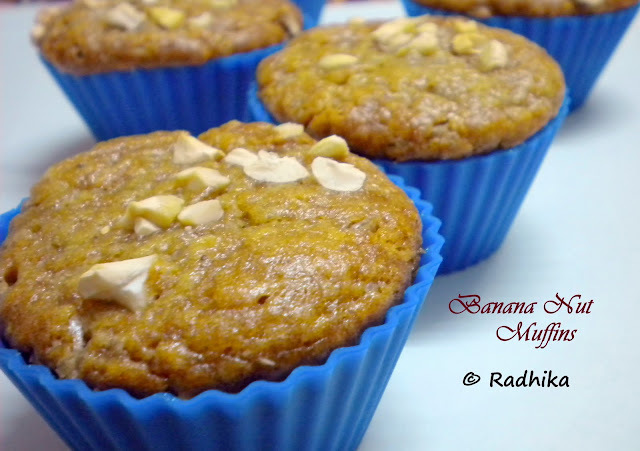 Scrumptious muffins, delicious and adorable..
best way to make the kids eat banana. my daughter also hates bananas.perfectly came out.